Robotic Process Automation refers to automation where a computer (robot) drives existing company software in the same way that a user does. It simply mimics a person’s action in completing rule-based tasks. No changes in your current systems and databases. No new security access required. Our partner, Blue Prism, provides the leading technology platform for creating robotic automated processes. Blue Prism’s unique software platform enables business operations in service industries and Business Process Outsourcers or Shared Services to rapidly automate manual back office processes by creating their own virtual, robotic workforce. This leads to a significant reduction in cost whilst, at the same time, improving accuracy and customer satisfaction. Blue Prism technology provides an alternative to traditional IT driven approaches by enabling business users, supported by IT, to rapidly, securely and flexibly build, validate, and execute new business processes across multiple applications and systems. The technology is scalable, secure, resilient, and flexible and is supported by a comprehensive methodology and operational framework. The technology is developed and deployed within a “corridor of IT governance” and has sophisticated error handling and process-modelling capabilities to ensure it can perform within demanding, highly sophisticated operating environments. Where does Blue Prism Robotic Technology fit in your organization? Blue Prism technology is specifically designed to address the “long tail of change”. There are tons of small back office processes in every organization which are not automated as this would require a huge IT effort, take a long time to implement and require a cumbersome approval process. With Blue Prism software you can automate these kinds of processes quickly with minimal requirement on your IT organization. Business units are constantly finding new ways to improve business processes, and so generate many requests to IT for corresponding custom applications or modifications to existing applications. But such requests often hit a wall of cost and priority. When IT cannot handle this volume of requests, business units typically create their own manual workarounds, often with the help of desktop tools such as spreadsheets and unstructured databases. The problem, however, is that these workarounds are not integrated into the enterprise’s larger IT framework, and therefore can be quite fragile, prone to error, and tend to be vulnerable to security breaches. 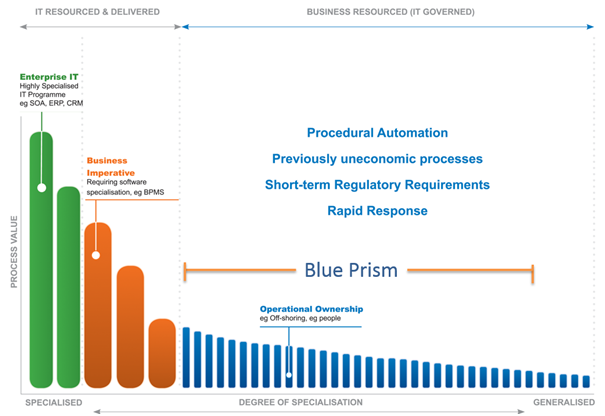 The Blue Prism Technology Platform addresses the right hand side of the “Long Tail of Change” (see graph above) by enabling business operations to automate these kind of processes quickly with minimal demand on your IT organisation. How is robotic automation different from traditional IT integration? 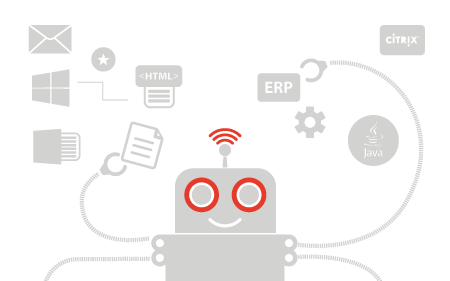 In office administration, clerical Robotic Automation refers to automation where a computer drives application software in the same way that a user does. This differs from the standard IT approach, as the robot is not programmed and therefore does not require a huge amount of IT engineering to install. In fact the robot is trained by a business user similar to how a new employee may be shown how to complete a task. Takes advantage of the presentation layer of existing applications. No changes in current systems and databases. No new security access. Requires complex integration of application and database layers. Driven by business / operations. Principally aimed at clerical staff replacement. Aimed at clerical staff acceleration. Targeted at small-to-medium-sized automation initiatives. Large integration / automation project. Quick to automate – days and weeks. Long implementation period – Months and years. Once set up by IT, business analysts can further automate the processes with just a few months of training in robotic automation tools. Requires software architects and engineers with years of experience of relevant programming languages, BPM tools, and enterprise application suites. It should be noted that Robotic Automation does not compete with BPMS and SOA initiatives but rather extends and complements them. These should be put together in the right combination to achieve your strategic goals. What processes could be good candidates for Robotic Automation? Process automation can accelerate back-office tasks in Finance & Accounting, Procurement, Supply chain management, Customer service, Human Resources and other service oriented business or back office operations. What companies can benefit from Robotic Process Automation? Typically medium-sized and large business operations in service industries, such as banks, utilities, Telco’s, BPO’s, SSC’s and others.